Newly confirmed Secretary of State Rex Tillerson had his first day in the office yesterday and was greeting by a crowd of the Department's Foreign and Civil Service employees. I admit that much has given me angst about the way things have been going for the last couple weeks, but he isn't one of those things. I am actually cautiously optimistic. The speech was a good one. And I was touched that he paid his respects at our Memorial Wall, inscribed with the names of all of our number who have given their lives in the line of duty. It touched me when he reached up and touched Ambassador Stevens' name. Here is the text of his speech if you don't have time to watch the video. I also want to thank Acting Secretary Tom Shannon, who has just been superb through this entire process. And Tom, thank you so much. (Applause.) It was truly and indeed an honor that Tom joined us in the Oval Office last night for my swearing-in, and I appreciated that he was there. When I wake up each morning, the very first thing I ask myself is: Are all of our people safe? The safety of every single member of our State Department family, regardless of where he or she is posted, is not just a priority for me. It’s a core value, and it will become a core value of this department. (Applause.) This means the State Department family here in the U.S. and all those agencies serving under chief of missions abroad, including Civil Service; Foreign Service officers and specialists; locally engaged staff of host country and third-country nationals; interns, fellows, support contractors and implementing partners; and not least of all, the family members who support us at home and in our service to our country overseas. One of the great – (applause) – one of the great challenges and thrills for the State Department staff is deciding how to confront changing conditions in every corner of the world. And I encourage all of you to use your natural and well-developed skills to adapt to changes here at home as well. What I ask of you and what I demand of myself – I will embrace accountability, honesty, and respect no less than anyone. As such, I will depend on the expertise of this institution. There are over 75,000 members of the State Department workforce, both Foreign and Civil Service employees, with an average of over 11 years of service in the department. I have 25 minutes. (Laughter.) You have accumulated knowledge and experience that cannot be replicated anywhere else. Your wisdom, your work ethic and patriotism, is as important as ever. And as your Secretary, I will be proud to draw upon all these qualities in my decision-making. We got a couple bits of good news yesterday. First, we found out that the President issued an Executive Order stating he would not overturn the executive order signed by President Obama affording protections to LGBT employees of federal contractors. President Donald J. Trump Will Continue to Enforce Executive Order Protecting the Rights of the LGBTQ Community in the Workplace President Donald J. Trump is determined to protect the rights of all Americans, including the LGBTQ community. President Trump continues to be respectful and supportive of LGBTQ rights, just as he was throughout the election. The President is proud to have been the first ever GOP nominee to mention the LGBTQ community in his nomination acceptance speech, pledging then to protect the community from violence and oppression. The executive order signed in 2014, which protects employees from anti-LGBTQ workplace discrimination while working for federal contractors, will remain intact at the direction of President Donald J. Trump. Of course, it does beg the question of why he would need to publically state he is going to continue with a particular policy. Part of the explanation I am sure is that rumors had been swirling that an executive order was forthcoming either rescinding the Obama protections or allowing discrimination based on "sincerely held religious beliefs" (or both). The latter could still be coming. I also suspect it could have something to do with his nomination of a Supreme Court Justice to fill the seat vacated with Anthony Scalia died (you know, the one that has been vacant since February because the Senate refused to have a hearing for Merrick Garland, the Obama nominee). More on that in a bit. The next nice surprise came in the form of a bit of support from the Democrats on the House Committee for Foreign Affairs. 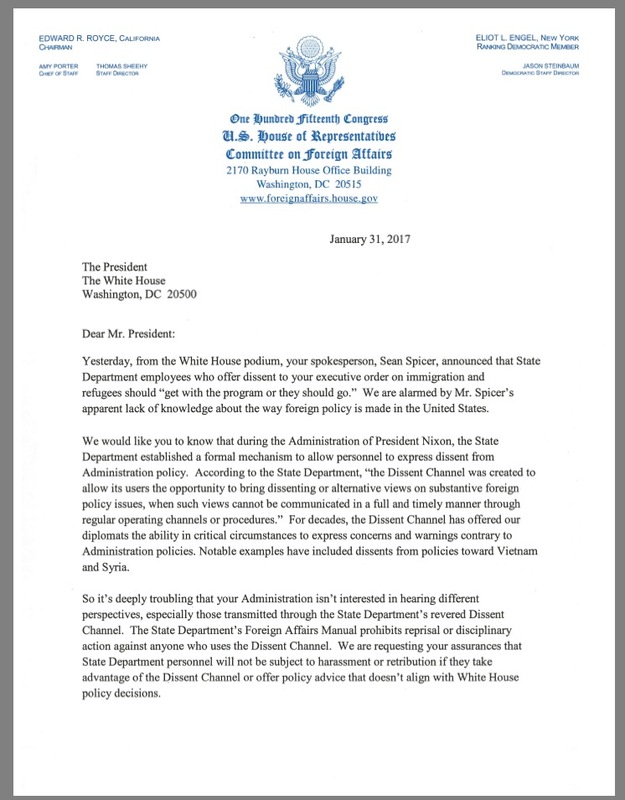 In a letter to the President, they expressed concern about Press Secretary Spicer's comments regarding those who supported the dissent channel message and not the President's policy, saying they should "get with the program or get out." You can read my thoughts on that here. And by the way, apparently more than a thousand people have signed it so far and more wanted to. And that is out of some 7,600 Foreign Service Officers (that number may be higher if it doesn't include FS specialists) and 11,000 civil servants. 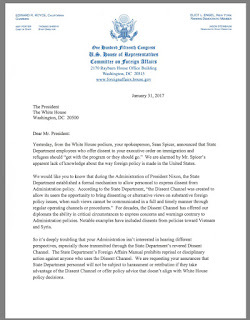 Yesterday, from the White House podium, your spokesperson, Sean Spicer, announced that State Department employees who offer dissent to your executive order on immigration and refugees should “get with the program or they should go.” We are alarmed by Mr. Spicer’s apparent lack of knowledge about the way foreign policy is made in the United States. We would like you to know that during the Administration of President Nixon, the State Department established a formal mechanism to allow personnel to express dissent from Administration policy. According to the State Department, “the Dissent Channel was created to allow its users the opportunity to bring dissenting or alternative views on substantive foreign policy issues, when such views cannot be communicated in a full and timely manner through regular operating channels or procedures.” For decades, the Dissent Channel has offered our diplomats the ability in critical circumstances to express concerns and warnings contrary to Administration policies. Notable examples have included dissents from policies toward Vietnam and Syria. So it’s deeply troubling that your Administration isn’t interested in hearing different perspectives, especially those transmitted through the State Department’s revered Dissent Channel. The State Department’s Foreign Affairs Manual prohibits reprisal or disciplinary action against anyone who uses the Dissent Channel. We are requesting your assurances that State Department personnel will not be subject to harassment or retribution if they take advantage of the Dissent Channel or offer policy advice that doesn’t align with White House policy decisions. Please reply as soon as possible confirming that your Administration will respect the law (P.L. 96-465) governing the State Department and the treatment of its personnel. It was signed by every Democrat on the committee. Thanks y'all! And for the record, I don't think most of us are going anywhere. We are the last line of defense for the Constitution (and the first line of defense to protect our military). So then came the unwelcome news, which was actually not much of a surprise (though the reality TV manner of making the announcement kind of was...I was expecting the President to give a rose to the Supreme Court nominee he selected since he invited the top two for the announcement and had clearly already made up his mind...). The President is nominating Neil Gorsuch to be the next Supreme Court Justice. This makes keeping the protections in place for LGBT people seem like a ploy to get our guard down (it didn't work, by the way). Gorsuch is definitely no friend to the LGBT community. In a paper for the National Review, he lamented that "liberals" are addicted to having the courts rather than the ballot box solve society issues including marriage equality. Never mind of course that it was the courts that overturned laws against interracial marriage at a time when 75 percent of the country opposed it. Because in a Republic, the minority is supposed to be protected from the tyranny of the majority, and the courts are generally our best defense for that. And never mind that it was the courts that desegregated schools. We should just let the majority vote on our rights, right? I admit I am not overly worried, only because he replaces the most far-right judge who was on the court. But I do worry about future appointments (circle of protection around the notorious RBG please). But I do think it shows we have to stay in, we have to fight to preserve the Constitution and our democracy, and we can't let our guard down for a second. I think most federal employees, and certainly a big swath of the country, is worried. Some days I feel like there is so much coming at us that we need to pay attention to that I just get overwhelmed. Where do you even start? And then I worry that if I don't say something, so many issues will have piled on and it will all just become normal. And it can't. And I see it. Like the removal of web pages that have been put up over the years on issues like LGBT rights and climate change. All gone. Yes, it is normal for a new administration to replace old policy pages with their own. But this many? And the not replace them with ANYTHING? Like those issues never happened, never mattered? And now we have the resignations from the Department. Again, normal for a new administration to want to install their own people. But this many career officers gone so fast? With no replacements in sight? And yes, they were career officers who were in Senate approved positions. But usually, they are allowed to move into other positions because they are not really political appointees. They are career diplomats. Diplomats who have served both Republicans and Democrats. And they seemed willing to stay. Instead, they resigned. Or retired. Or were fired. Or were just asked not to come back. So far, we know that Patrick Kennedy, Undersecretary for Management; Joyce Anne Barr, Assistant Secretary of State for Administration; Michele Bond, Assistant Secretary of State for Consular Affairs; and Gentry Smith, Director of the Office of Foreign Missions, are all gone. I've heard stories of several others. Politico reported that "As is standard when a new president takes over, each official had submitted a letter of resignation. But instead of keeping the officials on, as previous administrations have often done to ensure continuity and smooth the transition process, the Trump team accepted the resignations." They added that there have been rumors that these folks resigned in protest, but I doubt it. I worked closely with U/S Kennedy in his capacity as the mentor for GLIFAA, he was extremely professional and devoted to his work. And I hear from consular friends that A/S Bond was universally loved. they also said there is worry of a talent drain from State. I hope that won't happen, though I do know at least one person who resigned in protest. But I hope most people are dedicated enough to service, to the country, to the Constitution, to stick it out. But still, it is already a lot. And the void is felt. Diplopundit talked about how there is now no one in place who can declare an ordered or authorized departure. So if everything goes to hell at a post, just sit tight until they figure things out? Really? I know someone who couldn't get a random medevac cable processed because of "post-inauguration confusion." I worry things are breaking down. Not just at State, but in our whole country. And I worry most that our society's attention span has withered to the point that we can't keep our focus for four years. I remember reading something about outrage fatigue. It will all become normal. I got the CNN alert on my phone last night right as I got home. The President had just signed an executive order freezing federal hiring. No positions, except those in the military, that were vacant on January 22 may be filled. I am sure there are many who cheered. The swamp is getting drained. First of all, being called a swamp dweller is getting pretty old. Federal employees are not the ones getting rich off of the American taxpayer. For that, you might look to Congress, who has not been subject to pay freezes or pay stoppages in the event of government shutdowns. And they are curiously well off for people working for the people...I think you will find more millionaires there percentage-wise than you will among federal employees. Part of the trouble is that Americans have been, and are being, sold lies. As I said, we are not wealthy. Most of us are hard-working, solidly middle class folks who want to serve our country and pay our bills. We do not, contrary to what you may have heard, make more than those in the private sector. In fact, especially for those of us with university degrees, most of us make more like 24% less than we could on average if we weren't serving the country. But we want to serve, and none of us expects to get rich doing it. (and the ones who ARE making more than the private sector? Those are blue-collar jobs in the government, and I hope you wouldn't begrudge a janitor making just a bit more in order to serve the country and live in DC). And if you got rid of our jobs, we would head straight to the unemployment office. So it isn't like you could save the government money by getting rid of us. We aren't living off of inheritances. We need our paychecks to get by. And I bet most of us are living paycheck to paycheck just like you are. Completely false. Even with the hiring done in the last months of the previous administration, we are still at our lowest levels in decades. There were 2.7 million people on the federal payroll in May, and that number rose about 3% to 2.8 million in December (largely due to agencies trying to fill positions they needed before a suspected freeze happened. The civilian workforce, by comparison, grew 4.9% over than same period. Even at 2.8 million, the numbers are historically low. Hiring has been pretty flat over the last administration, and the current numbers are similar to the beginning of the Obama and Clinton administrations and lower than at any time during the Reagan administration. In the meantime, the population we serve has grown drastically. Percentage-wise, we are at our lowest rate in 70 years. Seven percent of the population worked for the government during World War II. Now, only 2% does. Yes, some of that number is offset by contractors, but while they are easier to fire than federal employees, they are also more expensive. False. A CBO report in 2011 showed that federal salaries make up 15 percent of discretionary spending in the federal budget. And nearly half of that goes to the Department of Defense's civilian employees. And that is not 15 percent of the total budget, mind you. Discretionary spending is just 40 percent of the budget. that means federal salaries account for just less than 6 percent of the total budget. Do you really think cutting there will help that much with spending? Actually, they don't. I heard during the shutdowns from members of my own family that if employees are "non-essential" (the term they used to use for employees who were told not to come to work during the shutdown), they should be gotten rid of. But the trouble is that some of those "non-essential" people were actually in training. Most of us were forced to come to work even under the threat of not getting paid during that time. That of course gave the impression that everything functioned just fine without the government. The trouble is, it was a lie. Notice that your social security check still got delivered? That is because employees in the Social Security Administration kept working to process your payments and the post office kept delivering the mail. And the ultimate irony is that the shutdown actually cost the taxpayers MORE money. Far from bloated, most agencies are actually understaffed. Just at our embassy, we have a number of positions that need to be filled, and now they can't. We have been told to do more with less for year, and I am sure we will be again. But at a point, we will have to do less with less. And the taxpayers will feel the brunt of it. Wrong. 85% of us live and work outside the Beltway, including Foreign Service Officers, who live in dangerous places and away from family just to serve you. And about 20-30 percent of us are veterans. So seriously, just stop. Stop with the name called and please stop with the abuse. We aren't swamp dwellers. We are Americans. Americans who have devoted our lives to serving you and to serving our country, often while making less than we could otherwise. Often at risk to our own personal safety. Often at great personal sacrifice. Beating on us may make you feel better, but it isn't getting you anything. Despite the fact that we give you a lot. Seems more and more like the change of administration means open season has been declared on federal employees. Federal employees have long been the whipping boys for certain members of Congress. There doesn't seem to be a problem they can't distract us from by taking aim at dedicated servants of the American people. They shut down the government and don't pay us (but they still get paid) any time they don't get their way on an issue. (and make no mistake, we all still work, because they don't want you to know how much you actually need the government). And when it comes to cutting the budget, it is always feds and not real areas of spending bloat (like insisting the military continue to buy equipment it neither wants nor needs because the companies making that equipment have wisely spread out the jobs across multiple states. This isn't a military need. This is a pork barrel jobs program). They freeze our pay for years. They threaten our pensions. They cut hiring when we are already at historically low levels and are stretched thin. And the farm out our work to contractors who cost more (but can be fired more easily) and sometimes even give us the likes of Edward Snowden. And now, they want to be able to fire us without cause. I get it. We have all dealt with THAT government employee. The one retired on active duty. The one who snarls at you when you need government services. The one who collects their pay but you can't really tell that they actually do work. I get it. I have dealt with those people too. But the majority of us are actually dedicated, patriotic and hard-working. We know most of us could earn more in the private sector but we choose to serve. To serve the country, to serve the people, to serve the Constitution. I have never met anyone more patriotic than the hard-working federal employees I have the fortune to serve with. That's right, for NO CAUSE. And they will not have any right to appeal. Of course, I posted this on Facebook, and many of my friends immediately chimed in with, "So what? Lots of businesses do that." And that is their right as business owners. But the government is different. The Civil Service is intended to be non-partisan. We serve all Americans regardless of their or our political affiliation (can you imagine if we didn't? I'm sorry, but I refuse to send social security checks to people from Party X. Government tenders will only be given to those from Party Y). The protections for federal employees are meant to keep us non-partisan, to keep us from facing political reprisals. That was the idea behind the Pendleton Civil Service Reform Act of 1883. Previously, federal positions were essentially the spoils of war, granted to supporters of the winning party. It is also the thinking behind the Hatch Act of 1939, which prohibits federal employees from participating in certain types of political activities. I notice they aren't trying to get rid of that. So here is where we feds stand now. * The transition team has asked for the names of people who have worked on particular issues, such as climate change in the Department of Energy and gender and LGBT issue at the Department of State (and were asked to "ferret out" those working on LGBT issues). * The Holman Rule has been reinstated, meaning that any member of Congress can target ANY federal employee and cut that person's annual salary to ONE DOLLAR. * Employees could be required to contribute more to their retirement, meaning an up to 5% pay cut. * Employees could be fired without cause and without the right to appeal. * And then of course for those of us in the Foreign Service, there is the added bonus of threats to withhold 50% of our security budget unless our embassy to Israel is moved from Tel Aviv to Jerusalem. No wonder people are afraid. Our jobs, our lives, have become the spoils of war. But yeah, thanks for your service.